If we talk about Tiffany's bags for men, it is an imperative to mention the two iconic handbag designer working for the company since 2009 and creating the elegant and trendy bags for men and women. Richard Lambertson and John Truex under the label Lambertson Truex had already earned reputation of exceptional quality handbag manufacturing. Unfortunately the financial crisis created a difficult financial situation and the company was sold to Tiffany & Co in the beginning of 2009. Both designers signed contracts with the famous jewelry brand and the first luxury leather bag line was created under Tiffany's name. The Tiffany Charles briefcase in brown color is an exceptional leather briefcase with useful inside compartments (can be zipped) and card slots. There is also holder for pens and additional slip pocket. The color availability is dark brown and black. It costs 1395 USD and is currently sold in the US. 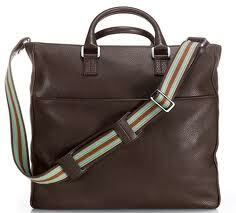 The Blake tote for men is a shoulder bag that is quite useful, it features a detachable shoulder strap that is made of canvas. This masculine Tiffany's bag is made of leather and has functional inside and outside compartments. 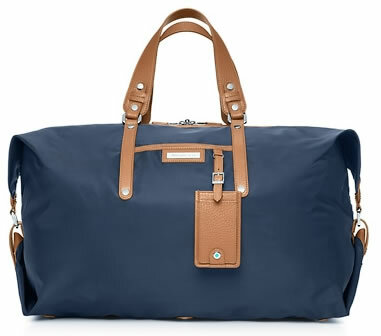 If you want something quality and designer one, there is a choice of simple duffle bags - practical, great looking, functional and wonderful quality. Also there is a color choice to choose from - classic black, beige and navy blue with light leather trims. 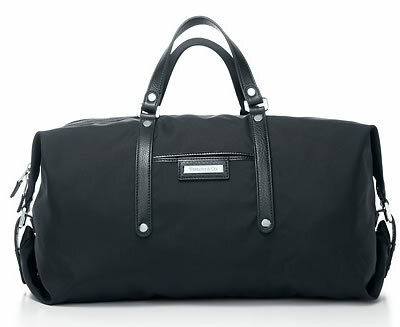 This duffle costs 695 - 795 USD (US shipment only possible at this time). It is made in nylon with grain leather trim. The hardware is brass that is plated with palladium. Inside is textile lined. It has two pockets and five more slip compartments. The shoulder strap can be removed. Size is 17.75" (width) x 8.5" (height) and 8" (depth). 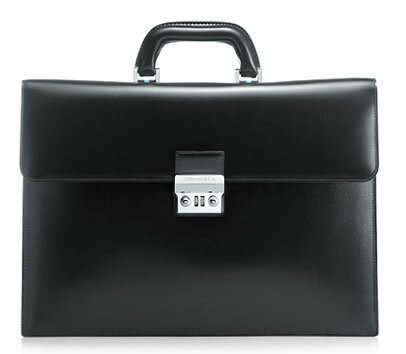 All these men's briefcases and tote bags from this brand are made in Italy. There is also an excellent choice of Tiffany's wallets and leather card cases for men. If you are looking for quality, this brand's classic looks men's bags are among the best on the market.